– You’re missing (insert recently sold or Canadian brewery)! – You’re lumping in total ownership with partial! – List the rest of the 124 AB InBev owned breweries! – That brewery is closed now! – That logo is for the 7 Bridges in Da Nang, not Jacksonville! I spent far too many hours over the weekend correcting, tweaking, and expanding the graphic to address many of those issues. Thanks to those who created other sources I could use as source material (/u/Hraes’ spreadsheet, Craft Beer Joe, Philip H Howard, and of course Wikipedia). Any visualization is a balancing act of information and intelligibility. 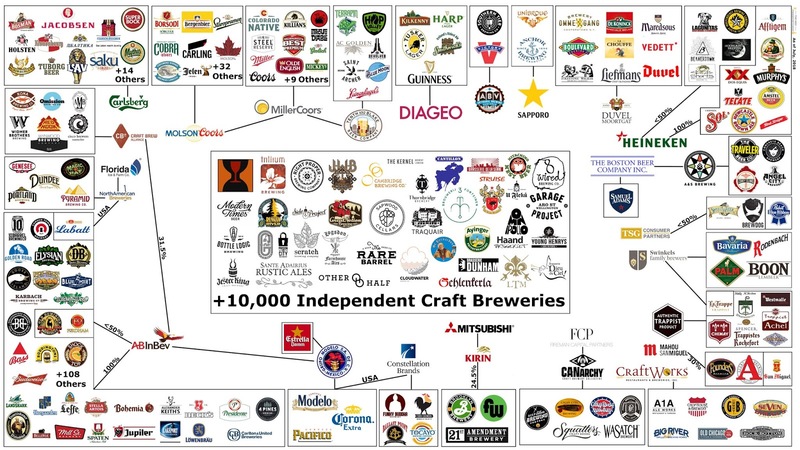 My first version was likely too simple to provide any deep understanding of the complex web of brewery ownership… while the updated version may be so complex that it is overwhelming (and that’s still without 108 AB Inbev brands). Feel free to let me know if I missed anything. I intentionally left-off private equity firms that own a piece of a single craft brewery (e.g., Bruery, Stone). I’m sure that there are other conglomerations outside the US that didn’t come to mind. It’s already starting to look like one of those crazy conspiracy diagrams, so I’m not sure how much more I could add. With this many complex relationships it is difficult to be completely accurate while maintaining legibility… especially when it comes to unique situations and convoluted relationships. So here it is without distinguishing different levels of ownership. If you’re reading this after July, 2018 don’t expect the graphic above to be up-to-date. Obviously no rights other than fair-use claimed on the brewery logos. I didn’t start working on this with the goal of changing what beers people drink. I don’t refuse to buy beer from “sellout” breweries… but all-else equal, I’d rather my dollars didn’t go to a company that uses its size to muscle small craft breweries off the store shelf or tap list (for example). It’s the same reason I stopped shopping at Northern Brewer and Midwest. In that regard there is a big difference between breweries owned by AB InBev, and to a lesser extend Molson-Coors, compared to those owned by CANarchy and Duvel-Moortgat. Even with those though, I’d rather support a small brewery where the money goes back into the brewery, rather than a private equity firm or international conglomerate. Independent craft beer isn’t always delicious. Wide-scale distribution of delicate beers takes both skilled brewers and a level of packaging and distribution channels that many small breweries don’t have funding for. That said, I’m not going to buy an insipid or uninspired beer simply because it has a low-level of DO (dissolved oxygen) and an absence of diacetyl and acetaldehyde. There are enough great beers available that I don’t need to sacrifice on quality or consistency! Here is an interesting piece on the Old Dominion-Fordham relationship with AB InBev. Jim Lutz, CEO: “In the years I’ve been here I’ve only met with the AB InBev people twice…” I was fond of Old Dominion before they were acquired in 2007. The first noticeable change was that the tasting room went from smoke-free to smoking permitted. Pretty quickly they closed the brewery in Ashburn, VA and moved production to Fordham’s facility in Delaware. The old head brewer didn’t follow (he, along with the equipment, became Lost Rhino). I may be out of the loop, but I remember Old Dominion producing a few interesting beers (like their Millennium barleywine aged in barrels… and even a version with Brett). Now all I see from them are pin-up girl logos and uninspired beers. Whether that is the result of AB InBev or the brewery itself doesn’t change many of the reasons I don’t buy their beers. While the Brewers Association had to draw a line somewhere for what is craft, I don’t find anything special about the 25% non-craft brewery ownership definition. What really matters is the relationship between the brewery and ownership. How much control of the beers is put into the hands of marketing or accounting? What sorts of incentives/investments are there for brewing innovation versus sales growth. Are resources primarily used to increase consistency/quality, or reduce costs? In the past BA has been all too happy to raise the barrels-per-year cap for Boston Beer, even though producing ~4,000,000 bbls/year as a publicly-traded company owned by a billionaire puts their trade-group needs much closer to a macro brewer than it does mine as a ~1,000 bbl/year start-up brewery. We’re at an interesting time in the growth of craft beer, hopefully the visualization helps illustrate that!